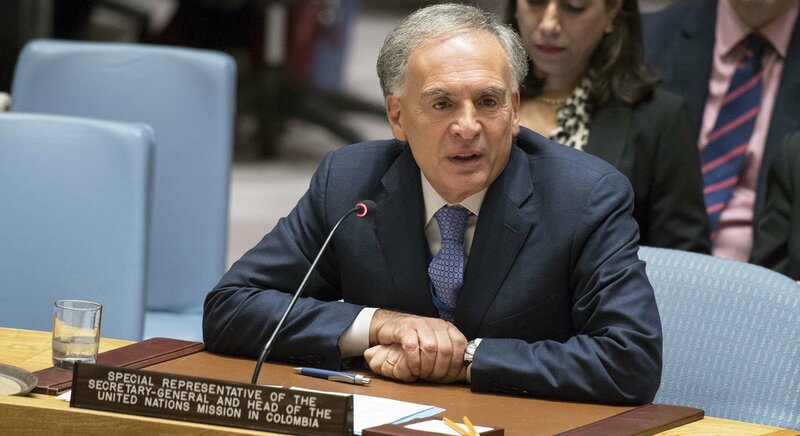 Jean Arnault, Special Representative of the Secretary-General and Head of the UN Verification Mission in Colombia, addresses the Security Council. The mid-March elections were the first after the signing in 2016 of a peace deal between the FARC-EP and the Colombian Government that ended the Western hemisphere’s longest-running conflict in which more than 200,000 people were killed. 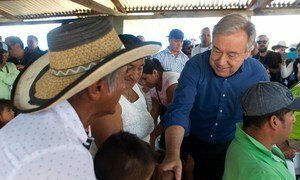 “While it is too early to take stock of a peace process that has set ambitious and long-term goals, we already observed that it has achieved a notable reduction of violence in the congressional elections,” Jean Arnault, head of the UN Verification Mission in Colombia, set up two years ago to monitor and support implementation of the peace deal. Among legislative developments, he said the Constitutional Court had endorsed the Law on the Status of the Opposition, which among other things provides opposition parties with access to media, funding and representation in the Senate and the Chamber of Representatives for runners-ups in vice- and presidential elections. It also declared constitutional FARC’s political participation, including 10 Congressional seats provided for in the Peace Agreement. Turning to the socioeconomic reintegration of FARC members, under a new decree, the Superintendent of Banks can provide banking services to former FARC members in the reintegration process – excepting those on international sanctions lists. Recognizing a number of new institutions as “a substantial change,” Mr. Arnault said “the next few months provide an opportunity to bring together government institutions, local authorities and social organizations to press forward” with the peace agenda. He also asserted that the last couple of weeks have brought new challenges to the peace process, such as the arrest of a FARC leader on drug trafficking, which “reverberated in a country that remains divided around the peace process. The Mission wholeheartedly supported the reintegration of former combatants on a more solid basis before the end of the Government´s mandate. As negotiations between the Government and the National Liberation Army have resumed, Mr. Arnault told the Council that both parties have reiterated their interest in UN support to implement a future ceasefire. “The unanimous support consistently voiced by the Council have helped sustain their resolve. It will continue to be a source of confidence and strength,” he concluded.